Goose Pond is a prairie pothole, a pond that is fed only by precipitation and run-off. Because of this, Goose Pond water levels change significantly only two or three days a year after a major run-off event. But right now, we’re seeing something we’ve never seen before! Goose Pond is normally four feet deep, but today, it’s at least seven. Above: Kampen Road (looking east toward Goose Pond Road). Water is eight inches deep and covers 1,000 feet of road. So far one car stalled in the high water and had to be towed out. Some of the asphalt was deeply undercut, and there are ongoing road repairs due to safety issues. Deep snow cover and ice, frozen ground, rain, and high temperatures resulted in record flooding and runoff levels. There is so much water in our above-ground system that you could now kayak from Ankenbrandt Prairie (east of Goose Pond) into Lake Mendota and only have to get out to maneuver around culverts. The good news is that scaup, goldeneyes, canvasbacks, mallards, Canada geese, and cranes have arrived and are using the sheet water. The bad news is there is damage to road infrastructure, and many low lying roadways in the area are closed or have high water advisory. Above: Goose Pond Road (looking north towards Arlington). 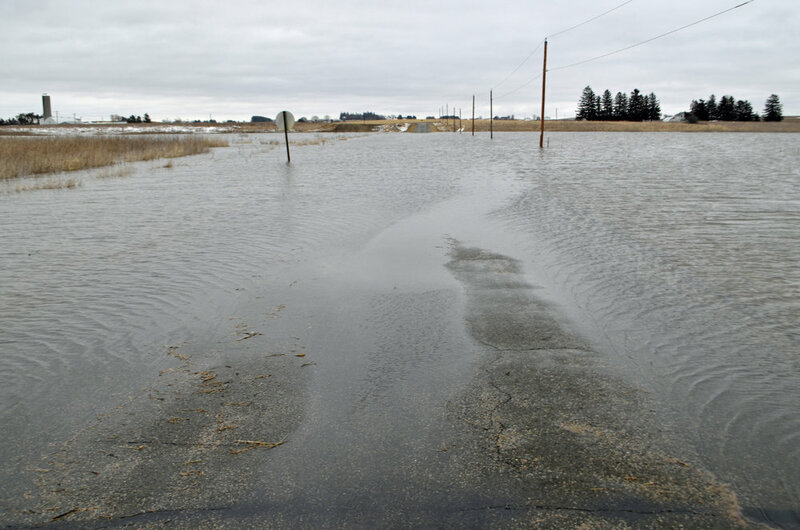 The road is covered by up to three inches of water for almost 1,000 feet. The dark mound to the right (east) of Goose Pond Road is the rock pile. The pull off next to the rock pile is where many people bird watch from the Goose Pond Road causeway, and it is completely flooded. If you are visiting Goose Pond, use safety precautions and common sense. In the 40 years that the Martins have resided at Goose Pond, water has only flowed west out of the pond to Lake Mendota on one other occasion. Above: Train Tracks (looking north). The train tracks are flooded up to four inches for 250 feet. A soft rail bed and nearby erosion stranded the train from yesterday evening until this morning. Above: Video (Kampen Road). Taken at 4:18 p.m. yesterday, this video shows the sheer volume of water flowing under the road and into Goose Pond. The stranded train is shown in the back. On September 10, 2018, after many months of planning and countless meetings and discussions, something big began happening at Goose Pond. Two bulldozers, a large backhoe, and an excavator rolled in Monday evening ready to start moving thousands of cubic yards of soil out of the canary grass dominated wetland. For the next four days, LMS construction worked long hours creating seven wetland scrapes for Goose Pond Sanctuary. Wetland scrapes are essentially isolated, shallow depressions that fill with water during part of the year, especially in spring. They’re often constructed to enhance wetlands that have filled with eroded silt from farm fields. Creating wetland scrapes effectively establishes diverse habitat for waterfowl, marsh birds, shorebirds, amphibians, and aquatic invertebrates. Goose Pond is a beautifully restored wetland just next door, but waterfowl breeding pairs like to be secluded and have their own territory to avoid competition with other pairs. As a result of creating these scrapes, we expect gadwalls, mallards, blue-winged teal, northern shovelers, northern pintails, and green-winged teal to find peace and contentment in their new nesting habitat. Shorebirds such as killdeer and spotted sandpipers are able to wade around in the shallow waters, searching for food. Other birds, like the barn swallow, will use exposed mud flats to build their nests. 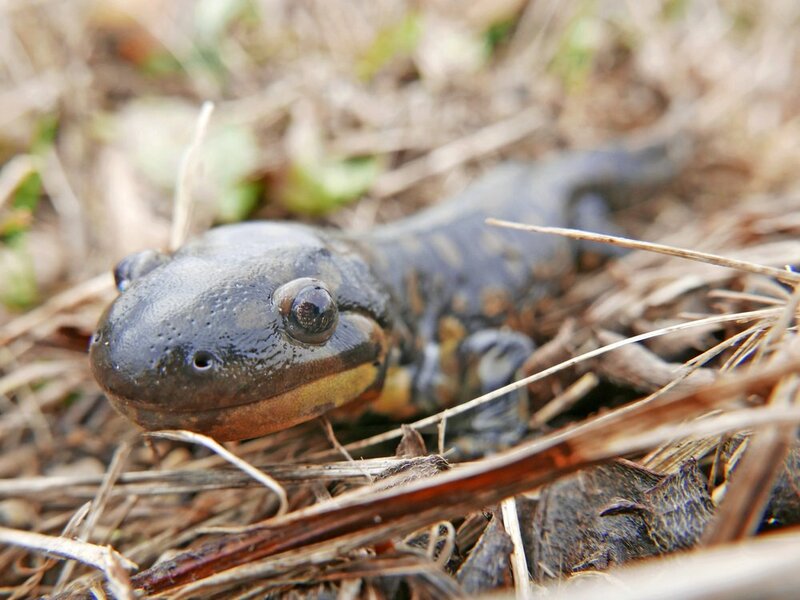 Chorus frogs, spring peepers, leopard frogs, eastern and Cope’s tree frogs, American toads, and eastern tiger salamanders will breed in the water filled depressions. We plan to conduct surveys to determine what amphibians are taking up residence in our scrapes. Many animals, like the white-tailed deer, will use the wetland scrapes as a water source. Because we have scattered scrapes of varying kinds at Goose Pond Sanctuary, little microhabitats will form and allow for greater plant and wildlife diversity. Scrapes that are not circular create more shoreline edge, which is going to provide better cover, food, and resting area for wildlife. As Goose Pond goes through wet and dry cycles, having multiple wetlands will provide refuge for wildlife. For example, in periods of drought, a scrape at a lower elevation might still hold some water when ones at higher elevation do not. Animals will have access to this scrape at lower elevation and will be able to take refuge there until more rain comes. Goose Pond is a beautiful prairie pothole that supports loads of wildlife year round. Wetland scrapes near the pond will enhance the biodiversity on the sanctuary by providing additional wetland resources. Photo by Arlene Koziol. A gradual 8:1 slope creates different vegetative heights as the water level drops and rises. This means that food sources can stay around longer in a self-sustaining, dynamic community. Furthermore, a gradual slope allows invertebrates to follow water levels and concentrate in a remaining pool as the water level drops. This can then be an excellent, easy-access food source for wetland birds. But a gradual 8:1 slope is not a cake-walk to achieve! Kurt Waterstrad from U.S. Fish and Wildlife Service, Louie Meister from LMS Construction, Mark Martin and Graham Steinhauer from MAS Goose Pond Sanctuary, planned the whole project out, from securing the necessary permit approvals (Kurt) to mowing and mapping out the site (Graham) and everything in between. Map of Goose Pond Sanctuary scrape construction. See chart below for more details. Goose Pond Sanctuary now holds 11 wetland scrapes to provide habitat and resources for a variety of species. Then, beginning on September 10, Junior, Gus, and Joe from LMS Construction completed the enormous task of scraping out approximately 5,950 cubic yards and depositing it evenly across our upland areas. They carefully and professionally ensured that each scrape was at the correct depth, acreage, and slope ratio. The sight and sounds of heavy equipment working in the sanctuary was an odd, yet invigorating experience, knowing the promise of what those bulldozers and excavators held! Kurt Waterstad posing with the laser elevation reader. Photo by Mark Martin. Start of the project with LMS Construction removing vegetation. Photo by Arlene Koziol. Graham Steinhauer taking GPS points while walking the perimeter of a scrape. Photo by Mark Martin. LMS Construction removing all the soil with a large back hoe. Photo by Arlene Koziol. Mark and Sue checking to see how the project is going. Photo by Arlene Koziol. Wetland scrapes filled with water on Friday, September 21st after 2.8 inches of rain. Photo by Mark Martin. Photo of Jacqueline Komada seeding uplands with fall rye. Photo by Mark Martin. 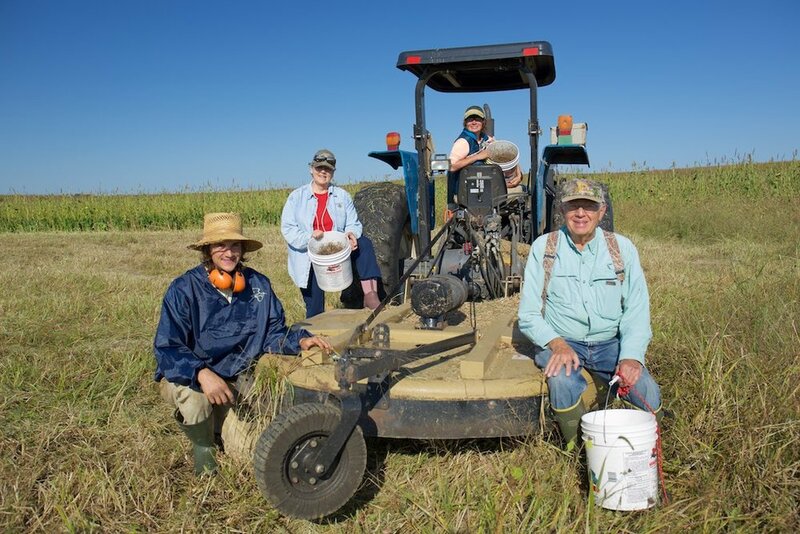 Graham Steinhauer, Jacqueline Komada, Mark Martin, and Bob Bennicoff hand-broadcasted 168 pounds of fall rye in the uplands where the soil was deposited to prevent erosion. The wetlands will be seeded this fall, using seeds that our staff and volunteers collect over the next few weeks (want to help? Click here!). Over the winter, we will create a plan for planting prairie shrubs for wildlife in part of the uplands. There are unique annual wetland plants that we can establish in our scrapes, including smartweed, water plantain, and bidens. These will provide high energy food for waterfowl. Soft-stem bulrush and and river bulrush may be planted, but could also naturally colonize along the scrape edges. (From left to right) Graham Steinhauer, Sue Foote-Martin, Jacqueline Komada, and Mark Martin with their buckets of collected seed. Photo by Arlene Koziol. We are thrilled to have this project in the works here at Goose Pond. 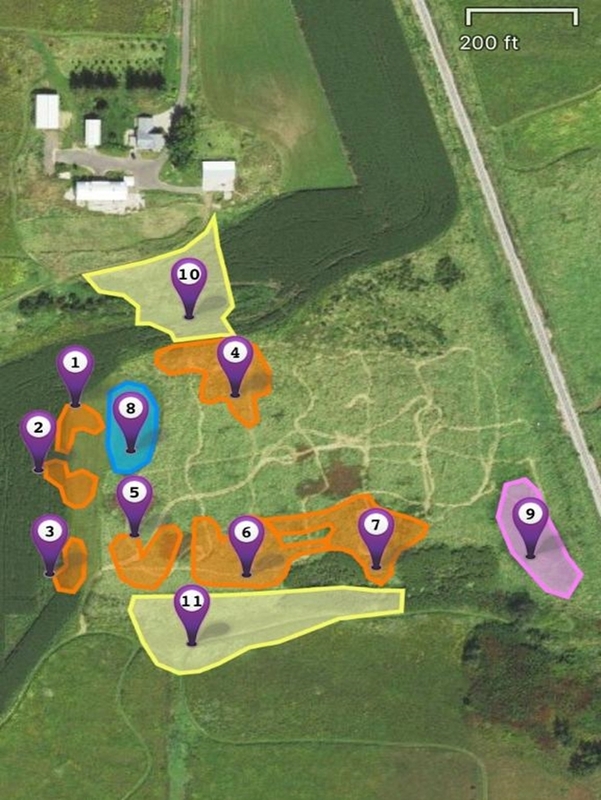 As one of the highlights of the year, these wetland scrapes are just another way Madison Audubon Society is working to establish diverse and protected habitat for generations to come. Thank you everyone for your incredible support! We want to give a special thank you to all of those who played a critical role in the success of this project: The Wisconsin Waterfowl Association provided funding through the North American Wetland Conservation Act grant. Both the U.S. Fish and Wildlife Service from the Wisconsin Private Lands Office and Madison Audubon Society also provided generous funding. How do you Goose Pond? Goose Pond Sanctuary is a cornerstone of Madison Audubon, an exceptional bird-watching site in south-central Wisconsin, and a symbol of Wisconsin's strong conservation legacy. It has grown from 60 acres that included much of the west pond-with-potential into a flourishing 660-acre sanctuary for native habitats, birds, mammals, insects, and amphibians, and the people who love them. For some of us, Goose Pond has been a frequent destination for decades; for others, Goose Pond is a new-found gem. Regardless, if you have a favorite memory of Goose Pond Sanctuary, help us celebrate it's 50th year of conservation, research, and education by sharing it below. We will showcase these stories at the various celebrations throughout the year. Thank you for your love for Goose Pond Sanctuary and the many hands that have helped shape it. We'd love to see your photos too! Please your Goose Pond Sanctuary photographs to Brenna Marsicek (bmarsicek@madisonaudubon.org) with a short explanation. By submitting photos, you give Madison Audubon permission to use them in education and outreach materials. Thank you! Thank you for sharing your memories! If you have any images you would like to submit to this project, please email them to Brenna Marsicek, Director of Communications (bmarsicek@madisonaudubon.org).